We had our violet club meeting this morning, as we always do on the 4th Monday of the month. I love seeing the ladies and it's always a wonderful and fun time. Today was especially fun as I won the monthly raffle, as I did last month. This time the prize was... 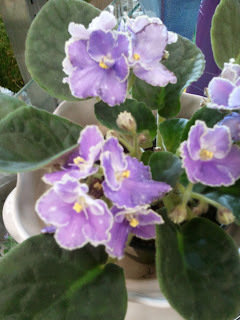 VIOLETS! (It's not always plants. lol) Ness' Crinkle Blue, Christening Gown, and Rob's Fiddle Faddle. They're not adult plants yet but I'm excited about them. Rob's Fiddle Faddle is blooming but the other two aren't quite old enough. All this for 25 cents! Our next meeting isn't until January as the club never meets in December and I'm really going to miss my violet ladies! I'm glad that I have plenty of plants to keep me busy! Yes, I bought the plant immediately! lol I also got the name of the nursery where they get most of their plants and I've checked out their "currently available" list. This place lists each plant with their actual name, so I'm very hopeful that I can get the name of my lovely pink NOID. Another woman that I know brought home Anthoflores Little Axel from this same nursery. Very exciting day, even amidst the aches and pains of whatever flu bug that I'm dealing with right now. The plant has now been disbudded and put into isolation. I saw no signs of thrips on any of the violets but you can never been too sure. Also, you can't see mites with the naked eye and there were LOTS of cyclamens in the nursery today, even if they were in a completely different room. You can see a touch of lavender in the lower blossom. Here's a look at a Frozen in Time that I saw a month or so ago. Because I'd seen this plant in person and it's such a distinctive look, I was able to make a positive ID on this one. 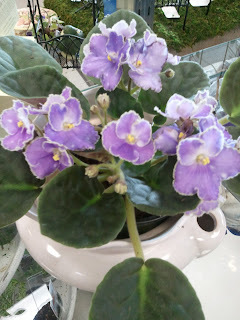 Last March I went to my first African Violet show. I was enamored by all the beautiful plants and blown away by all the wonderful people that I met. I quickly joined a local club and my plant collection started to grow by leaps and bounds! In May there was a "challenge" put out by another club to encourage people to enter their violets into the show coming up this next March and I thought to myself, "Why not?" A woman posted last night that she'd entered some of her plants in a local show. She ended up winning two BIS and several other awards. She came home minus some leaves that had been pinched off without her knowledge and thrips. From the thrips and the measures that she took to protect her other plants, she lost 5 of her plants. 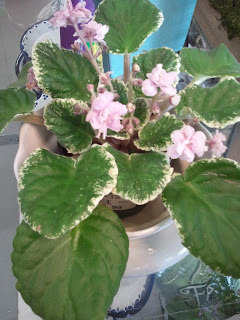 Today I read a blog entry from another woman who took some of her plants to show last spring. Her plants aren't doing so well now and she's suspecting mites. She's thinking that she may have to throw away her entire collection. I really love some of my violets and my oldest ones have only been here for a little over a year. I'd be heart broken if I took some of these wonderful plants to show them off and they got sick and died as a result. Especially when it's known that these plants can live for decades, with proper care. Yes, I know that they're looked over for pests when they enter the show area but things get missed and there's always a chance that *other* plants in the nursery where the show is held can cause issues as well. I'm a volunteer for the upcoming show and that'll be a lot of fun but I'm seriously wondering if I should leave my plants at home. A good day for a violet. I could see the soil and there was mold on top and it was extremely obvious that water was the last thing that it needed! I lifted up one of the leaves and the whole plant lifted... it had completely rotted off of the stem and was going to die if it didn't have some care and soon. The receptionist has a connection with this plant because it was given to her 5 years ago when her mother passed away, so I offered to bring the plant home and see what I could do with it. I cleaned off all of the excess soil and rot and shortened the stem. There was a good amount of "neck" that was still healthy, so that was a good sign for me that the plant will survive. Took off all the extra dead leaves and a few that weren't doing so well, scraped the neck up a bit, and stuck it in some soil. This poor little girl is now in a container with some good light and it's now time to wait and see. The container the plant was in. See the water marks on the side? No wonder it was drowning! It was no effort at all to pick the plant up like this. You can see the end of the stem here. The pot after I removed the plant. The "good" part of the stem/neck. A different angle of the stem/neck. I snapped it off this far and scraped it up a little bit for roots to form in the soil. The top of the plant with flash - in the hospital. I'll take more photos later after the plant has had a chance to realize she's in a good place! Lucky Me - If this one weren't missing leaves due to a cat encounter, it might be holding its flower stalks up better. This is one gorgeous violet! I think this is the first photo that I've gotten of the blossom fully open as I seem to be having some kind of culture trouble with the plant. The blossoms either open with the inside withered or they fall over quickly. I think this one needs more humidity? Even though I've had troubles, every single blossom is definitely showing the "double" that the official description shows in FC2. 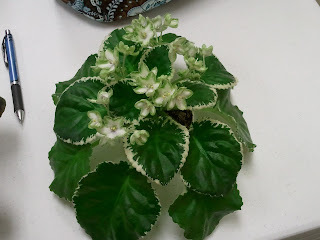 I've posted photos of this plant before but this is the first time it's bloomed so heavily in awhile. The plant has had some conflicts with my youngest cat (she's knocked the plant off the shelf a couple of times) and so the leaves are in poor shape and it's very lopsided but I love the blossoms SO much! Jeanette Domiano hybridized some gorgeous violets!